Information on the Piceance-East Douglas Mustangs, located in western Rio Blanco County of northwestern Colorado. Thank you to the Bureau of Land Management for their informational brochures. Interested persons may pick up their own copies at the White River Field Office, 220 East Market Street, Meeker, CO 81641. The White River area is full of history. As early as 1882, settlers crossing this region recorded seeing bands of wild horses. 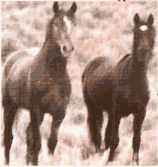 With the depression of the 1930s, herds were increased by the release or escape of domestic horses from abandoned homesteads and small ranches. Today, these wild descendants share this basin with large oil and gas exploration activities and livestock grazing. Water can be a precious commodity for people and animals. Make sure you bring enough water on your viewing trips. Use a “good neighbor policy” when through this herd management area. Leave the gates as you find them. Please do not trespass on private lands. Private lands are marked on maps available for purchase at the BLM office in Meeker. Main and county roads are well traveled, but BLM roads are isolated and bumpy. Dirt roads are passable for passenger cars only in good weather. Go 19 miles north on Highway 13 from Rifle. Turn west on Piceance Creek Road (CR-5) to Ryan Gulch Road (#24). For additional maps or further information about this area, contact the White River Resource Area Office. The herd runs from 90 to 145 head. Bays, blacks, sorrels and browns are dominant. 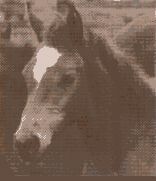 Mixtures of grays, buckskins, palominos, paints and chestnuts can also be seen. This wild horse area encompasses 148,000 acres of gently to moderately sloping pinon-juniper woodlands throughout; mostly mountain shrub, sagebrush with pockets of Douglas Fir and Aspen. Elevations vary from 5,600 to 8,700 feet. Antelope. elk, mule deer, sage grouse, eagles, hawks, buzzards, prairie dogs, coyotes, horned lizards and rattlesnakes can be found in Piceance Basin. In the spring, view horses at 84 Mesa and along Yellow Creek. In the summer, herds will migrate to higher elevations. Herds will concentrate on the windswept ridges and southern-exposed slopes. Look for horse trails along the face of Cathedral Bluffs. Four-wheel drive vehicles and hiking trails are recommended. Snow and summer thunderstorms can cause the clay roads to be difficult and impassable at times. This is not a BLM operated or BLM sponsored site. It is run by private wild horse and burro enthusiasts. We are thankful to the BLM for providing the information which is presented here.